It’s not every day that I chop into a leather coat. In fact, I don’t remember ever sewing with leather before. 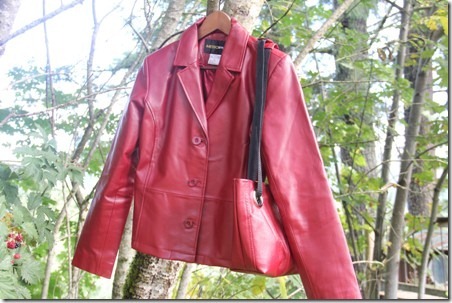 But my bravery was rewarded last week with a new short jacket and a big chunk of red leather. I think I was more excited about what I could do with the part I cut off, but I do love my new jacket. The first thing that came to mind for my extra leather was, maybe obviously, a bag. I decided to work with the bottom hem of the coat as the top of the purse, but this pattern could also be made using regular fabric. I’m big on pockets, so you’ll find lots of those inside. I also like to wear my purse across my body when I’m shopping, so I’ll show you how these straps can be adjusted at the end. To make this bag, you’ll need a piece of leather or 1/3 yard of medium weight fabric for the outside, 2/3 yard of medium weight fabric for the lining and pockets, an 8” or larger zipper, interfacing, one magnetic purse snap, two sets of large metal grommets and 66 inches of 1” wide webbing. Cut two pieces from the leather, each measuring 14” across the top, 12” across the bottom and 11” down each side. The sides should angle in 1” on each side from the top to bottom. Measure in 2” from each side and 2” from the bottom at each bottom corner and cut that square away. It should be slightly angled to match the side. Cut the same shape from the lining fabric. Also from the lining fabric, cut one piece 9” wide by 8 1/2” tall for the cell phone pocket, one piece 4 1/2” wide by 6 1/2” tall for the lipstick pocket and one piece 8 1/2” wide by 11” tall for the inside of the zipper pocket. 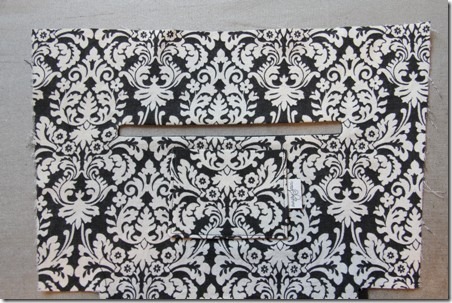 I chose to cut the last one from a contrasting fabric, shown in black below. Fold the small lipstick pocket right sides together. Stitch around all raw edges (using a 1/4” seam, as throughout unless indicated otherwise) leaving 2” open on one side to turn. Clip corners, turn right side out and press. Repeat with the cell phone pocket. Pin the cell phone pocket 3 1/2” from the top and 2 1/2” from each side on one lining piece. Stitch down both sides and across bottom 1/8” from the edge. Stitch through all layers from top of pocket to bottom 4 1/4” from right side to create two pockets. Pin the lipstick pocket on the other lining piece, 4/12” from the top and centered between the sides. Stitch the sides and bottom 1/8” from the edge. 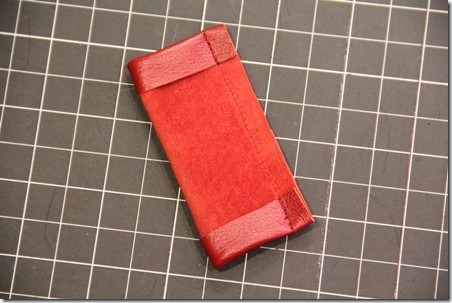 Draw a rectangle on the wrong side of the zipper pocket 1/2” from the top, 1/2” from each side and 1/2” wide. Pin above lipstick pocket so the top of the drawn rectangle is 3 1/2” from the top and 3” from each side of the lining piece. Stitch around the rectangle, following the line you drew. Carefully clip through both layers in the center of the rectangle. Cut through to within 1/4” of each end. From there, clip to each corner as shown by the red lines in the photo below. Do not clip through the stitching. Grab the bottom edge of the pocket and stuff it through the slit you just cut. Pull it from the back until the entire pocket is behind the lining. Make sure it’s laying flat on the back and press well from the front. It should look like this from the front. And this from the back. Shorten zipper, if necessary, but sewing over teeth and cutting off below. Make sure zipper still extends beyond the opening you just created by at least 1/4”. Pin zipper behind opening, centering the teeth and making sure the pull is accessible from the front. Stitch around the opening, close to the edge, using a zipper foot. From the back, fold the pocket up so the top edges meet. Press the fold. Stitch the sides and top of the pocket together, 1/4” from the edges, making sure to move the lining piece out of the way and using caution near the ends of the zipper. Your pocket should look like this. 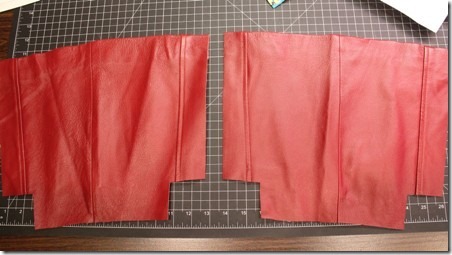 Now that all of the pockets are completed, pin both of the lining pieces right sides together. Stitch 1/4” from the sides and bottom, leaving the squares at the corners open. Press the seams open. Flatten the corners together so the raw edges meet and the seams touch. Stitch 1/4” from the edge. Repeat with the two leather pieces. Be sure to use binder clips rather than pins to hold the leather. Turn the leather right side out. Find the center of each side of the lining. 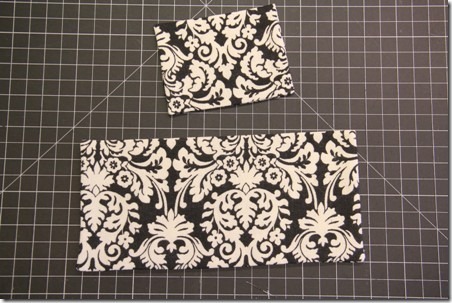 Apply a 2” square of heavy interfacing to the wrong side of each side. Mark a dot at the center 1 1/2” from the top edge. Apply the magnetic snap over the dot, following the manufacturer’s instructions, on each side. For mine, that meant cutting a small slit on either side of the dot, pushing the tabs through from the front, adding the back and bending the tabs. Press the upper edge of the lining toward the wrong side 1/2”. Slip the lining into the leather bag, wrong sides together. 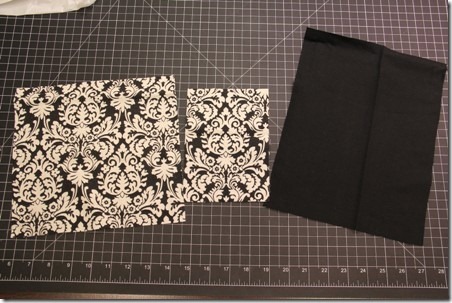 Using binder clips, clip the lining to the bag 1/8” from the bag edge. Top stitch around the top 1/4” from the edge of the leather. Mark your desired spot for the grommets. Mine are 2 1/2” from the side seam and 1” from the top (to the edge of the hole). Carefully cut the hole through both layers. Apply the grommets according to the manufacturer’s instructions. I can’t recommend the ones I used because they were without instructions, even on the website they directed me to on the package. As far as I can tell, you put a ring on the front with tabs through the hole, one on the back and bend the tabs over to hold it in place. I like how they turned out, but the lack of instructions was disappointing. For the strap, cut two pieces of leather, each 4” by 3”. Fold the short sides under 1/2”. Fold right sides together and stitch the long edge. Turn right side out, which is a bit of work. Center the seam. Slide onto the 66” long piece of webbing to the center. Stitch near each end and 1” in from each side. Slide the webbing through the grommets on the bag. Push both ends of the webbing into the second leather tube and stitch like the first one. By keeping both leather pieces on the handle together, this can be a shoulder bag. …and you can wear it as a cross-body bag. Cool, huh? I chose not to add a bottom to this bag on the inside because I wanted it to stay a little more flexible for cross-body wear, but you could certainly cover a piece of cardboard or plastic and add it if you want it a bit stiffer. Whew, that’s a lot, right? Well, I’m not done…tune in on Wednesday for another project!